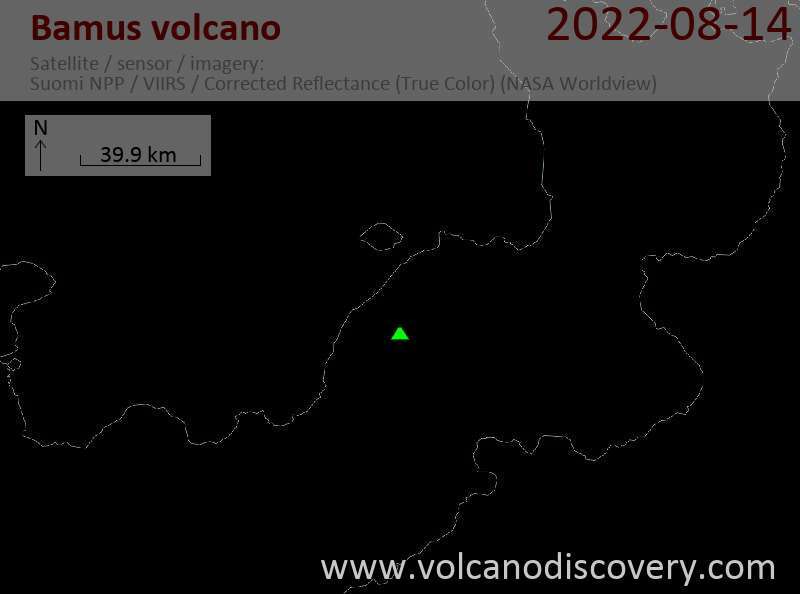 Bamus volcano (also known as South Son, Ulawun being the father) is a symmetrical stratovolcano SW of Ulawun volcano, 16 km inland from Stettin Bay. The volcano is thickly covered by rainforest and fern thickets. The last confirmed activity of Bamus was around 1888, as villagers describe in local accounts. Bamus has a 800 m diameter breached summit crater filled by a lava dome consisting of basalt-andesitic bouldery lava. The dome has overflowed the old crater through gaps on the west, south west and south east. There are fumaroles, sulfur deposits and steam vents on the lava dome. The steam plume emitted from the dome is visible from the sea. Bamus volcano has a flank cone on the southern flank and a large, 1.5-km-wide crater with 2 small adjacent cones halfway up the SE flank. Young pyroclastic-flow deposits are found on the volcano's flanks. Bamus and Ulawun are the highest volcano, and 400 m higher than all other volcanoes of the 1000 km long Bismarck arc. This suggests that they are near the stability limit of how high volcanoes in this arc grow, before they tend to suffer collapse. Emissions of vapor "with a tint of gray color" (i.e. ash) was observed on 12 July 2006, most intensely between 1010 and 1110 hr (local time). The emissions were "forceful" and coming out of the crater. 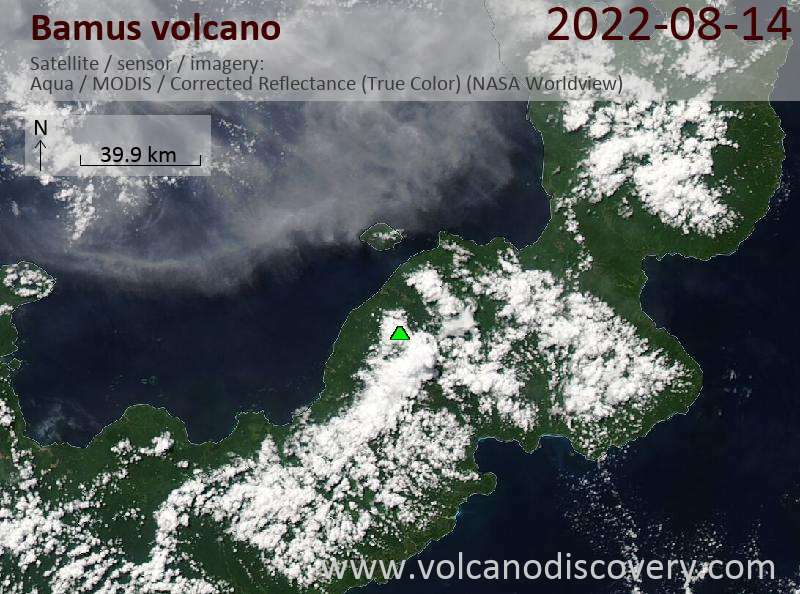 No other observations including thermal satellite monitoring confirm a new eruption of Bamus volcano took place. Most likely, the event was only a pulse of stronger steaming from one of the cracks in the lava dome. A seismic swarm occurred at Bamus volcano in 1990. Earthquakes started on 2 February when almost 100 earthquakes were recorded reaching up to a maximum of 5.8 magnitude.Between 10 and 15 Feb, about 1,400 events were recorded including 3 earthquakes of M 5.8-6.0. A second peak of activity occurred between 25 and 28 Feb with 880 quakes including 2 of magnitude 5. A temporary seismograph network revealed that most quakes were in a 10-km-long NNE-trending zone on the S flanks of the volcano. No significant changes were observed at the surface and no eruption followed the unrest.